At rest my left foot is fine. When I first stand up my foot aches in the area where my toes meet my foot. It seems to radiate across the top. Mostly as I am stepping forward with my right foot and my left foot is bearing my weight in the extended position. If I walk for a while, the pain seems to subside a little and become more bearable. But, as soon as I get off my feet for a bit and stand up, the ache is back full on. I went to a specialist and he didn't see anything in the x-rays, so he was really pushing these $500 shoe inserts on me. I don't feel like spending that kind of money on something if he can't even tell me what's wrong. I was thinking it could be a stress fracture or arthritis? I am 43 years old. Mildly active. I kind of agree with you; if the doctor cannot give you a diagnosis, how does he know that custom orthotics are going to help you? In any event here are a few thoughts. I do not think you have a stress fracture, even though your area of pain is a common site for this type of problem. For openers, stress fractures would tend to hurt more as you walk, while you state the pain seems to subside somewhat. Additionally, you state that the pain travels throughout the top of the foot, whereas a stress fracture of one bone would tend to hurt primarily in that particular area. Moving further along, just because your x-ray does not look abnormal, this does not mean you do not have the beginnings of arthritis in what would be the metatarsal phalangeal joint, which is where your toes articulate with the rest of your foot. Depending on how much pain you experience when you first start to walk on your foot determines what needs to be done. Obviously, your foot hurt enough to seek out medical attention. The first thing I would look at are the shoes that you wear. Shoes such as flip-flops, boat shoes and being barefoot a lot will cause excess bending at the metatarsal-phalangeal joint and this can inflame the joint. Wearing more rigid shoes such as sneakers or thick soled dress shoes limit the excess motion at the joint and this can help relieve your symptoms. So that would be the first change I would recommend. Secondly, if you can tolerate them, I would start on a round of anti-inflammatory medication such as Aleve, Motrin, or Advil and take the medication on a daily basis , say for ten days, as directed on the packaging. That may go a long way to "quiet" down the inflammation. 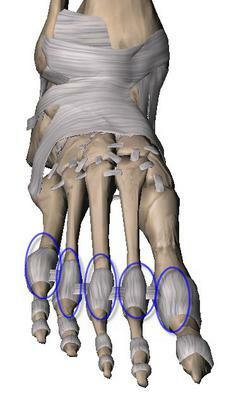 You could try an orthotic to stabilize the foot and reduce the excess bending of the toes. At this point you should try a medical grade over the counter orthotic such as the ones we sell on this site; to see if the concept of an orthotic is helpful. A custom made orthotic might be something to consider down the road, but it should not be your first line of defense. You may find that by trying some or all of these suggestions, you are able to quiet down the problem as it is very common for this type of pain to resolve itself. Having said all that, I would be remiss if I did not mention the possibility of extensor tendonitis as the cause of your pain. This is an inflammation of the tendons that bring your toes upward. Again, from excess motion in the foot, these tendons can become inflamed and hurt in the area where you are experiencing pain. But, like a stress fracture, this pain would tend to worsen the more you walk, while you state your pain tends to lessen. The treatment for this, at least the "try it on your own treatment" would be the same as already described. If you cannot resolve the pain on your own, you may want to consider a cortisone injection into the area or perhaps some physical therapy.